Varying from pretty rosettes to rings or any other festive type of shape to add an extra touch to the holiday season. Meringues are always a success. They are crunchy on the outside with a chewy core. This offers an amazing taste sensation. 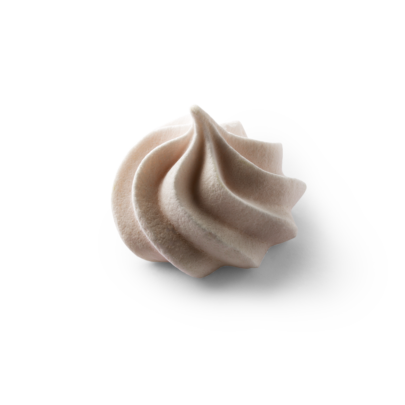 Meringues are extremely versatile: from a treat alongside a cup of coffee or tea to key ingredient in an exquisite and colourful dessert. The perfect base for various desserts or to decorate other dishes with. Perfect on the table, but also delicious as petit fours, during high tea or in any other dessert. An extra treat with a good cup of coffee or crumbled up in a luxury hot chocolate. A perfect counterpart in a chocolate or fruit dessert with forest fruits or dates. Luxurious coffees and chocolate milk specials are an absolute trend. Crumble the meringue over a whipped cream topping. Make a layered dessert in a nice glass and alternate fresh fruit, crumbled up meringue and whipped cream. Make the best ice cream cakes with meringues, fruit and cream. Make a sweet fruit skewer. Thread the meringues and pieces of fruit alternately onto a skewer and decorate with chocolate. Available in a range of festive shapes during the holidays, such as Christmas trees or nests. When kept in sealed packaging, meringues can keep up to a year. They are available in a range of packagings: a container with a flowpack, a cellophane bag, packed individually in a bucket or in a block-bottom bag.